One of our premier fit out completed by our team in Sydney over the course of 6 weeks. Construction started with ripping up carpet and including an elevated platform. The hallway needed to be closed in. 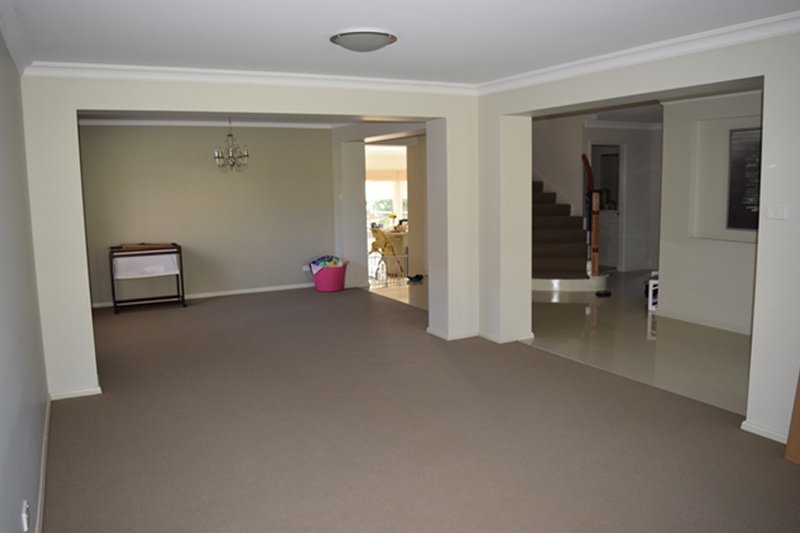 It was decided to convert the extra unnecessary space into an office for the client. Working with our trusted subcontractors, the cabinet used in this home theatre was completely custom designed with polyurethane, recessed into the wall for a sleek & concealed design. The Universal team and our contracted builders incorporated soundproofed bats & walls to conceal the sound within the dedicated space, thus allowing the home theatre enthusiast to enjoy his cinema experience, without disturbing the neighbours or anyone else in the home. along with LED light stripping, and 6 dimmer down lights for an aesthetically pleasing, and modern designed home theatre. This Universal Home Theatre solution is a Dolby Atmos & DTS:X 5.1.4 configuration using our trusted & preferred brands; Epson, Yamaha & Jamo. 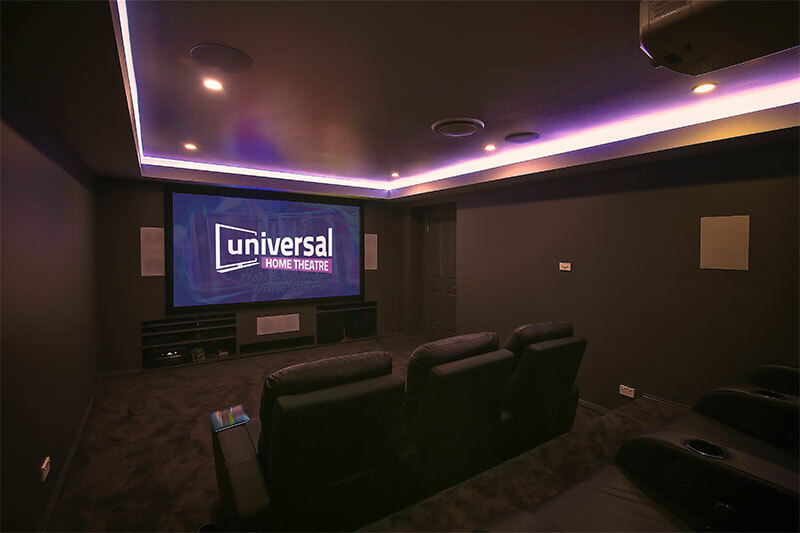 Guiding the customer every step of the way, and working with our customers building subcontractors – Universal Home Theatre created a full 9 channel system from scratch, redesigning a spare room, into a Home Theatre masterpiece. This project started as an extended, underutilized room that the customer wanted to convert into a future proofed media room. Using our Yamaha Flagship Audio / Visual Receiver as the main driving source, this powerful & authentic 5.1.4 home theatre configuration decodes Dolby Atmos & DTS:X seamlessly in a 5 x 4 square metre room. This state of the audio decoders in the Yamaha are suitable for both movie & music playback, using a 32Bit ESS Sabre DAC for authentic & natural drive, whilst bringing music & home theatre to life. Dolby Atmos is the future of Home Theatre and encapsulates the listener in a full 3 Dimensional Sound Sphere, providing 360-degree rotation of sound and additional overhead presence. Available on many Blu-Ray discs on the market today, movies such as Max Max: Fury Road, Divergent & Terminator: Genesis, already have the metadata imbedded on blu-ray, with more titles being remastered as we introduce Ultra High Definition to our Entertainment marketspace. Once the blu-ray information is decoded via the Yamaha processor, the home theatre opens a whole new sound stage of immersion, replicating an experience formally reserved for professional grade home theatres. Keeping with the request of the customer, Universal Home Theatre designed a theatre with aesthetics in mind. Using Jamo In-Wall LCR, & In-Ceiling Overhead Speakers, the system blends into the environment impeccably, offering a neat yet dynamic experience. The Yamaha Aventage series of amplifiers are a flagship design from Dolby Atmos & DTS:X are the future of Home Theatre, and a difference maker in setting your home theatre apart.